Lingshi is a mountain village 12,000 ft. (altitude) located in the Greater Himalayas of Bhutan. It takes four days trek into this wilderness. Our protagonist, 49 year old Ugen Tenzin has been the postal runner for 26 years. The documentary follows his track in the winter when the route is snow bound and in mid summer when the monsoons lash out. Through him the documentary introduces the yak rearing community of Lingshi. They live in a pristine environment. It is difficult yet peaceful with just the bear basic necessities. 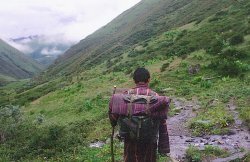 Ugen Tenzin walks to the capital of Bhutan ever month. Twelve to fifteen days is spent on his travel. It has been adventurous and dangerous travelling alone, sometimes nearly loosing his life. But his service has paid dividends. His 26 years and a steady income has made him fairly prosperous. Despite the odds, the risk involved, the tiring ascents and descents of high mountains and valleys, he will continue until retirement.He has seen and experienced both sides of life in the bustling city and his quiet village. Given the choice, its home that's best even if it takes four days to get there. Ugyen Wangdi finished his film studies from the Film and Television Institute of India, Pune. He opened his own film company and produced educational and corporate videos. In 1998 he made a documentary film Yonten Gi Kawa (price of knowledge) which won an award at the International Film Festival in Nuoro, Italy and a Certificate of Merit from the San Francisco International Film Festival. The documentary Yi khel Gi Kawa (price of letter) is a sequel to "price of knowledge"
Director Ugyen Wangdi will be available for Q&A after the screening.